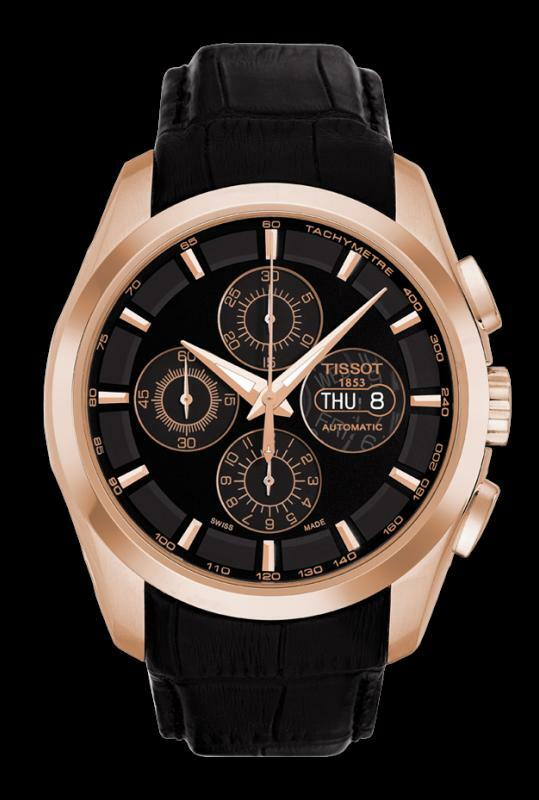 Rose gold-plated stainless steel case with a black leather strap. Fixed rose gold-plated bezel. Black dial with luminous hands and index hour markers. Tachymeter scale around the outer rim. Dial Type: Analog. Luminescent hands and markers.Day of the week and date display at the 3 o'clock position. Chronograph - three sub-dials displaying: 12 hours, 30 minutes and 60 seconds. Valjoux 7750 automatic movement with a 44-hour power reserve. Scratch resistant sapphire crystal. Transparent case back. Case size: 43 mm. Case thickness: 15 mm. Round case shape. Band width: 24 mm. Tang clasp. Water resistant at 30 meters / 100 feet. Functions: hours, minutes, seconds, calendar. Additional Info: date calendar at 3. luminous rose gold tone hands and hour markers. one second with 30 minute and 12 hour totalizers. small seconds sub dial. Sport watch style. Watch label: Swiss Made. Item Variations: T035 614 36 051 00, T035-614-36-051-00, T035/614/36/051/00, T0356143605100. Tissot Couturier Valjoux Men's Watch T035.614.36.051.00.